Tyler Gorman/Staff Photographer Binghamton Association of Mixed Students (BAMS) and Powerful United Ladies Striving to Elevate (PULSE) host a discussion on interracial dating, examining the difficulties of handling cultural differences and familial tensions. 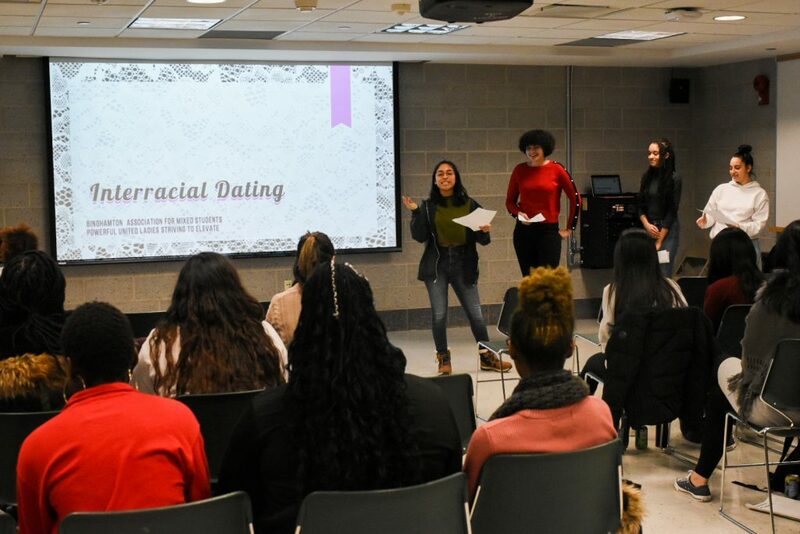 In the days leading up to Valentine’s Day, the Binghamton Association of Mixed Students (BAMS) and Powerful United Ladies Striving to Elevate (PULSE) collaborated to host a discussion on the cultural differences and expectations many interracial couples face. On Monday, the two student groups held their second annual “Interracial Dating Discussion,” which consisted of conversations on a series of topics, including racial fetishes and handling cultural differences between families. Taylor Duval, events coordinator for BAMS and a sophomore majoring in biomedical engineering, said she thought the event was a good way to confront issues that usually aren’t discussed. Jennifer Tiburcio, president of PULSE and a junior majoring in political science, said the event was meant to help students create a meaningful discussion. The discussion mainly dealt with the cultural tensions interracial couples might face in their dating lives, such as when a partner says something racist or offensive. The conversation also touched on racial fetishes and how to introduce partners to different-race relatives. Jerry Mathew, social liaison for BAMS and a sophomore majoring in mechanical engineering, said he believed the discussion about racial fetishes was especially important. Andrew Young, a sophomore majoring in systems science and industrial engineering, said he was interested to hear from members of PULSE about their experiences, which differed from his own because of the societal pressures placed on women. Participants also offered personal stories from their dating lives. One attendee said her parents were an interracial couple but still had reservations about her dating someone outside her race. Another said that she feels that all her relationships are interracial because she is mixed and it’s hard to find someone with the same ethnicity and identity.